All levels of an organization want more detailed levels of accountability. No surprise there. Executives want to reward their best employees and managers want credit for the good work that they’ve done. But, with the shift towards freelance talent in full shift, workforce managers are looking for new ways to hold their 1099 contractors accountable. For starters, it helps to have (and to use) metrics. Assigning some form of quantifiable measurement to your evaluation allows you to gauge progress, and unimpeded visibility into who is doing what allows companies to boost accountability across the board. Not surprisingly, it becomes increasingly more difficult to uphold accountability in organizations managing a freelance workforce. It’s hard enough to get contractors to submit deliverables on-time, let alone keeping track of the actions of hundreds of on-demand workers geographically dispersed around the country. As a director or manager, you’re responsible for the actions of your on-demand workforce. Who’s doing what? When are they doing it? Do they have the tools at their disposal to be successful? These are all questions you’d want quick answers to. When an issue comes up with a customer, you need to be able to quickly determine what happened, so you can immediately resolve the issue and keep your customer’s happy. Ultimately, cultivating an accountable on-demand workforce will drive responsibility in your internal team and your contractors, and help make your on-demand workforce program a success. What are the 4 most important metrics to track in an on-demand workforce? It’s safe to say the more data you have the better. If you have data on everything you do, you can always report on anything as it comes up. The tricky part is capturing the data without slowing down your team’s progress, and then extracting actionable and proprietary insight. Reschedules: who submitted a request for a reschedule and when. Who approved the reschedule. Notes: when and what notes were sent back and forth from the worker your team. Budget increases/expense reimbursements: when was a budget increase or expense reimbursement submitted and who approved it. You want your activity stream to order items in a simple, chronological list format so you can easily read down from most recent to oldest actions. You want the person responsible for taking the action up front with a timestamp to each item in the list. Icing on the cake is adding easy-to-decipher iconography to the list so your brain can filter out what you’re looking for faster. What are you waiting for? 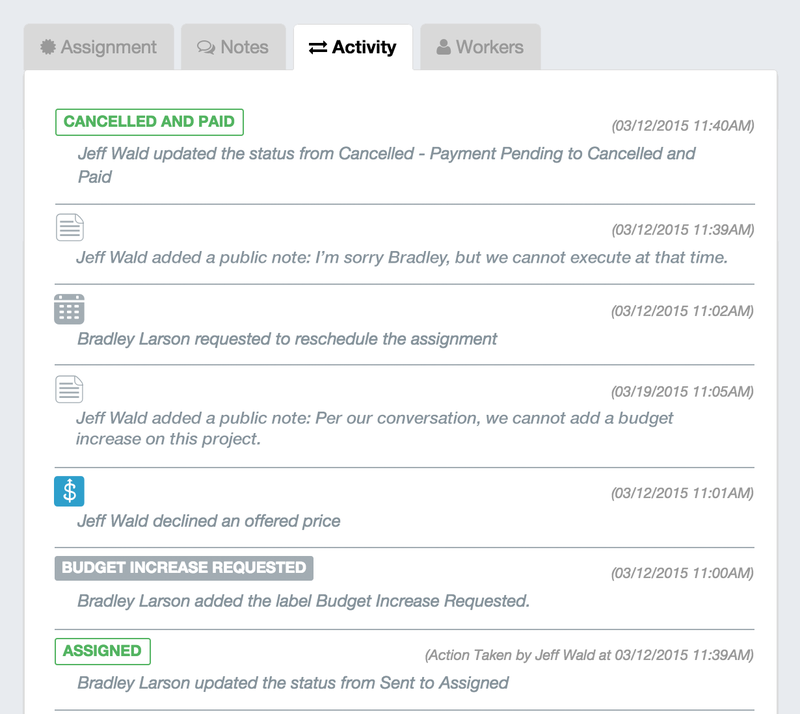 Hold your 1099 contractors accountable by using WorkMarket’s intuitive activity tracking tool. Request a demo today! Are Your Workforce Solutions Ready for the Freelance Boom?